A submerged rock at high tide which offers great fish life and good coral cover. A couple of valleys play home to oriental sweetlips and there are some big groupers around. 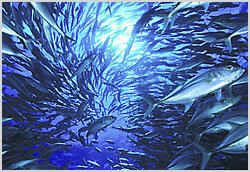 The bigger feeders such as jacks and tuna can be found out where the currents are stronger. There are a few other interesting dive sites in the area including Lighthouse which has a "honey hole" on the point that is home to sweetlips and batfish with mantas often spotted on the safety stop. Crystal Rock named after the surrounding clear waters just breaks the surface and is home to large schools of fusiliers and anthias beneath it. Nice soft coral coverage here with some impressive table corals. There is a small mound northwest of the rock where different species of fish school seasonally, including tuna and mackerel. Castle Rock is another nearby spot with good fishlife including batfish and morays. Soft corals and sea fans are prolific at around 20 meters Currents can be strong, usually flow eastwards and are much stronger at the surface than in the deeper water but it is possible to find shelter near the top of the rock where conditions are calmer (hence the name of this site). Sharks and big rays can be spotted here.